My cast iron skillet is definitely the most versatile pan I own. I just love how I can create a wide variety of cast iron skillet recipes with just this one pan. 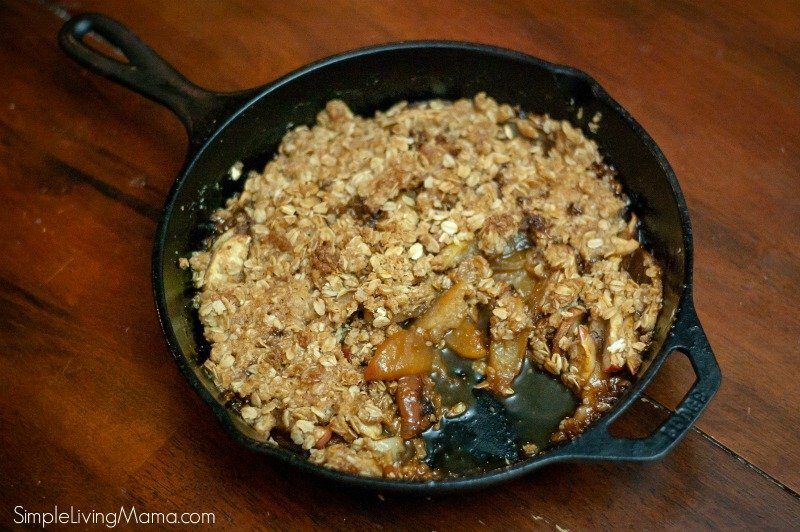 Today, I’m sharing my cast iron skillet apple crisp recipe. 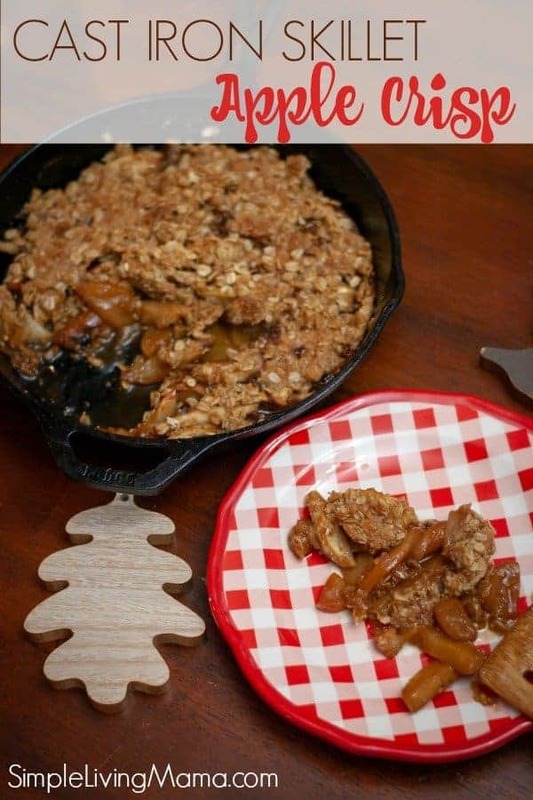 This recipe is perfect for the cast iron skillet because you can start it on the stove and finish it in the oven. Let’s get started! As a homeschooling mom, I did an apple unit with my little ones in the month of September. Nothing screams “FALL” more than apples. After we read the book “How To Make an Apple Pie and See the World,” we got started on this apple crisp. 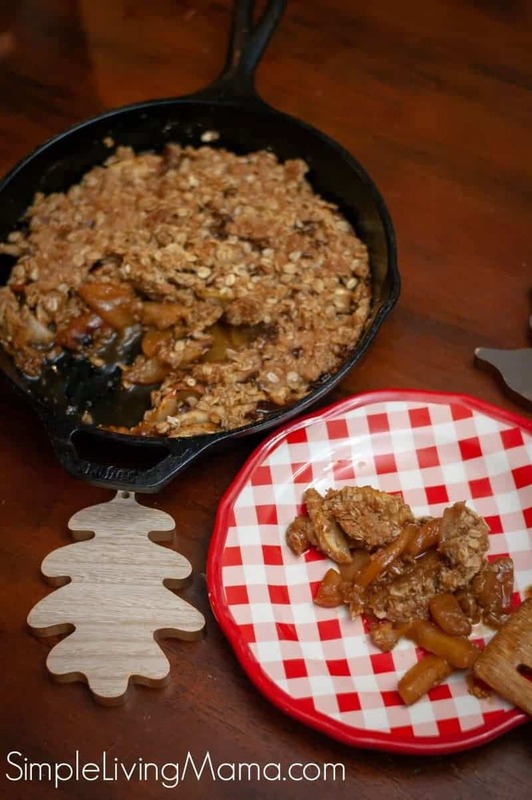 Now, you can make an apple pie in your cast iron skillet just as well as you can make a crisp, but a crisp is more kid friendly and fool-proof. I was making this on a busy weekday afternoon and I didn’t want to fuss with a crust. Plus, the cast iron skillet just makes it seem fancier! 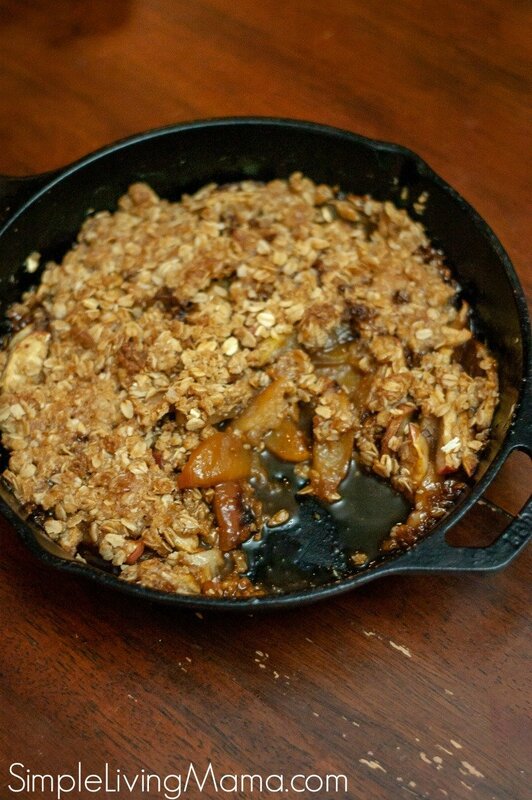 This apple crisp recipe calls for ingredients you likely have on hand. I used six apples. We chose Gala and Honeycrisp apples because those are our favorites, but you could use any variety. 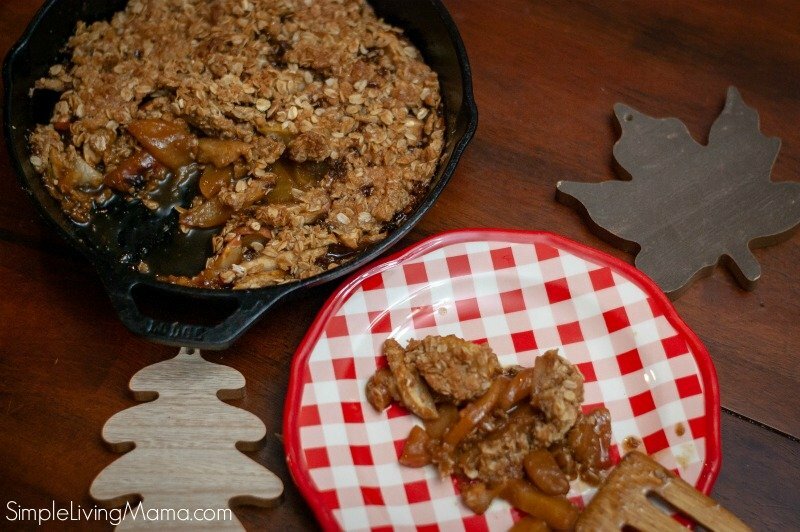 Granny Smith apples are especially delicious in an apple crisp. I started by peeling the apples and then slicing them. 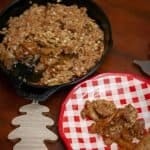 After that, I made my “crisp” by combining 1 cup of oats with 1/3 cup brown sugar, two tablespoons of flour, and 5 tablespoons of cold butter. I used my fingers to cut the butter in. You could use a pastry cutter or even zip everything in your food processor. I heated my 10 inch cast iron skillet on the stove at a medium-low heat. I melted in two tablespoons of butter, 1/4 cup sugar, 1 teaspoon of cinnamon, and a dash of salt. Once all of that was combined, I added in the sliced apples and sautéed them for a few minutes just until the apples began to get soft. I then turned off the heat and added the crisp topping. The apple crisp baked in the oven at 350 degrees Fahrenheit for 35 minutes and came out absolutely delicious! Vanilla ice cream or whipped topping makes a great addition to the crisp, but you can eat it by itself like we did and it’s just as delicious! 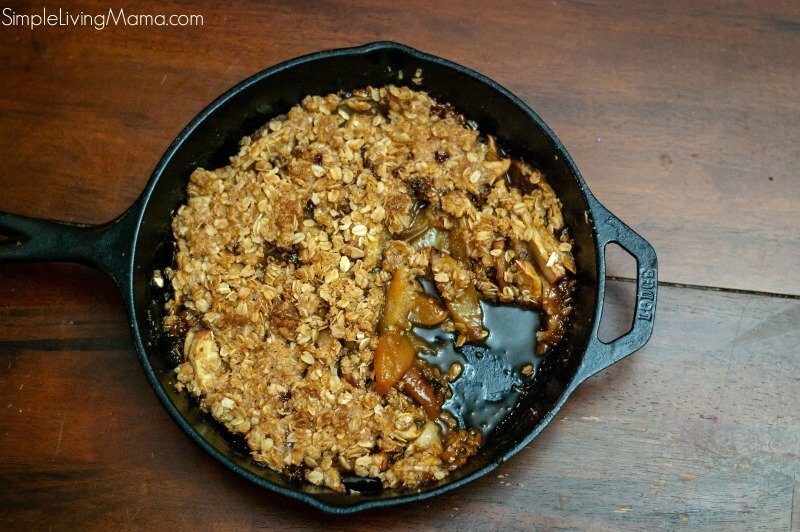 A delicious apple crisp recipe made in a cast iron skillet. Combine oats, brown sugar, flour, and butter in a bowl. Cut in butter with fingers or pastry cutter. Heat cast iron skillet over med-low heat. Melt in 2 tbsp butter. Stir in brown sugar, cinnamon, and salt. Add apples and cook for five minutes until apples soften. Remove from heat and sprinkle on crisp mixture. This looks so good. I will have to give it a try.